Sandro Boy,bay Oldenburger Stallion by (Sandro / Wiadoro [Grannus ]), born in 1993, standing approximately 16.3 hands. 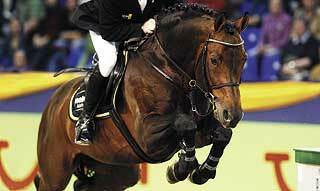 A fascinating appearance: After winning the World Cup finals in 2006 in a superior manner, Sandro Boy continued his career by adding highlights such as winning the Grand Prix in Hannover, Bremen and Lyon to his show record. He already earned more than € 758,000. With his ingenious jumping technique Sandro Boy was the only one to complete his 100 day test in Münster-Handorf with a dream score of 10.0 in loose jumping. He won the jumping index with a total score of 145 points. Amongst his small number of offspring is the mare Sabrina, who issuccessful at CSI** level with Marcus Ehning ,the still young licensed stallion Sandro Boy Junior, who is winning 1.30-1.40m classes ridden by Jessica Kürten and state owned stallion Saccor – competing at the 1.50 level and sire to the licensed stallion Sandrino, who time after time wins young horse classes. Upon entering the auction ring, Sandro Boy’s foals caused fierce bidding duels. He possesses a high concentration of jumping genes through a direct combination of Sandro, Grannus and Argentinus. Additionally Sandro Boy is a descendant of a very precious dam line, which produced the licensed stallion Grascode, who is competing at 1.50m, the Young Horse Campionship finalist Granius – now residing in Mexico – and the Oldenburg County Champion Langan. It is with great pleasure that we offer you this highly elegant jumping-idol for breeding.